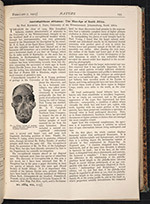 ”Australopithecus africanus: The man-ape of South Africa.” Nature, 1925, 115:195-199. 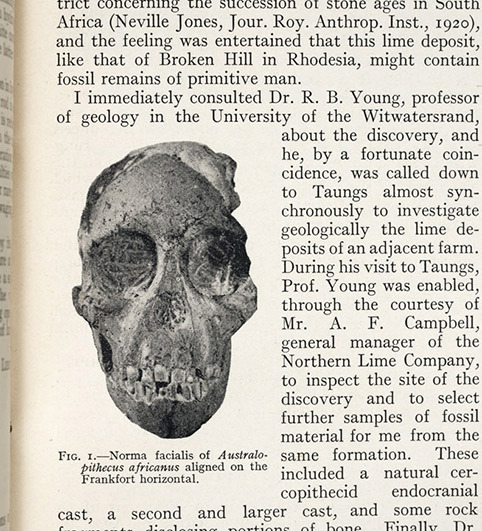 In 1924, Raymond Dart, a professor of anatomy in South Africa, received a fossilized primate skull from a limestone quarry at Taungs. Dart recognized that the fossil was not a baboon, because it had human-like teeth, and a spinal opening that suggested it was a biped. 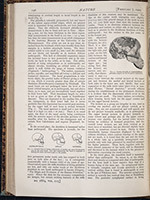 Moreover, it came with a brain cast (endocranial cast in technical terms) defining a brain that was much more like that of an anthropoid ape or a primitive human. Dart concluded that he had found a fossil that was intermediate between living great apes and humans, and was possibly pre-human. His announcement was not well received by the anthropology establishment, and Australopithecus would not be accepted as a valid genus until the 1950s. But Dart did implant the suggestion that perhaps anthropologists should turn to Africa to search for the origins of humankind.